1. From the Administration menu, click the Custom Field Groups option located under the CUSTOMIZE option. 2. Click the Add link. Arena creates a New Field Group placeholder. 3. Click the Edit icon for the new Custom Field Group. 4. Enter a Group Name for this custom field group. Users select this group name. 5. Select a Category. You can customize this Custom Field Module Category Lookup. 6. Click the Update icon to save. 7. Click the Name link of the new Custom Field Group. 8. Click the Add New Field icon to create a field. 9. Complete fields, as desired. •Title – Enter the name for this custom field. •Title Location – Select where to display the field. Options are left, right, top, bottom, and none. •Address – This field gives users the ability to enter an address. •Area – This field enables you to select an available Group Area. You can create Areas in Groups. •Check Box – This field gives you the ability to create a multi-select list of options for users. Enter values in comma-delimited format in the Values box that displays below the Type drop-down. •Custom Query – This field gives you the option to enter a custom SQL query. •Date – This field creates a date field for users to enter a date. •Document – This field gives users the ability to attach a document. You must create at least one Document Type for this field to be available. Refer to Document Types. •Drop-down List – This field gives you the ability to create a drop-down list of options for users to select. Enter values in comma-delimited format in the Values box that displays below the Type drop-down list. •Image – This field enables users the ability to upload an image. •Lookup Type – This field gives you the option to select from existing Lookups. •Person Attribute: This field links to person attribute on the person detail page. •Phone Number – This field gives users the ability to enter a 10-digit telephone number with the option to enter an extension. •Radio List – This field gives you the ability to create a single-select radio list of options for users. Enter values in comma-delimited format in the Values box that displays below the Type drop-down list. •Rich Text Field – This field enables the ability to enter rich text. •Static HTML Content – This field enables the ability to enter static content, with the option to use HTML code/formatting. •Textbox- This field gives users the ability to enter text. •Rows – Use to expand height area for fields; enables word wrapping for the number of entered rows. •Pixels Wide – Use this option to adjust the width of the custom field, especially when using multi-select check box, radio list, and static HTML Content. •Visible – Select the Yes radio button to make the field visible. •Required – Select the Yes radio button to make fields required. 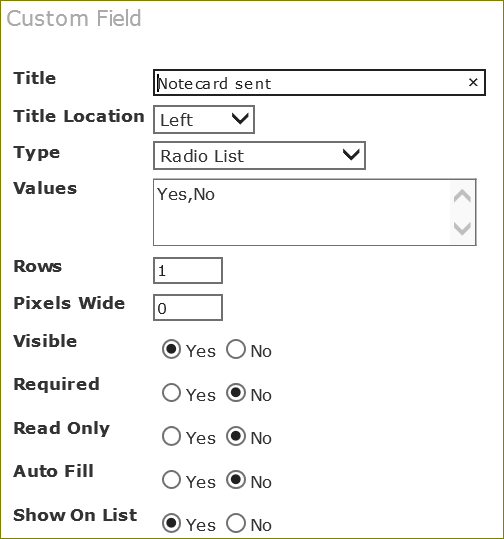 •Read Only – Select the Yes radio button to indicate fields that are view only. This makes the field display as a disabled field (grayed out). This is good to use with a Static HTML field. •Enable Auto-Fill – Select the Yes radio button for the field to auto-populate, using existing Arena data. This option is for fields behind a login. •Show on List – Select the Yes radio button to display the fields on the page where used. For example, if the Custom Field Group is used for a Tag or Group, field(s) display on the Members tab page. 10. lick the Update button. 11. Repeat steps 8 and 9 for all fields you want to add to the Custom Field Group.